These 13 downsizing designer tips will let you love your next home as much as your last. So if you’re an empty-nesters, or semi or newly retired you don’t have to give up the quality and designer touches you’re used to in order to downsize into a simpler home! AND none of these tips require major renovations like moving walls. But instead they are all designed to transform your home by updating and upgrading the finishes and fixtures like paint, flooring, window treatment and light fixtures. Even your kitchen and bathrooms can be transformed this way by painting, re-facing or replacing cabinets, and replacing countertop, tile, sinks, etc, while keeping the layout. Downsizing done right will give you the designer looks you love, and without the mess, cost and time of a major renovation. 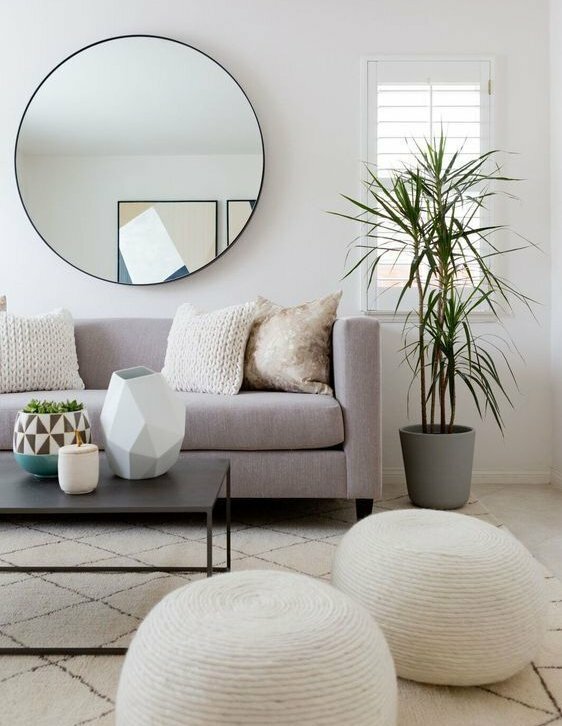 Light walls (neutral or pastels) will automatically make your rooms feel bigger. If you want your ceilings to feel higher hang your draperies at the top of the wall like this room. When your spaces are well-lite, they will not only look bigger but they will feel cheerier. The multiple light levels dimmer switches and 3-Way lamps will give your spaces means you can vary the mood as well as the light for different activities. Dimming for watching TV and conversation or brighter for reading and hobbies. HOW TO DECORATE SPACES TO LOOK BIGGER! Maximize your space to make it seem bigger than it is just by decorating! COLOR: Accessories. art work, plant and flowers. TEXTURES: Fluffy towels, woven baskets in bathrooms. In other rooms consider faux fur pillows or rugs, nubby woven ottomans, velvet fabrics or tall sticks in a floor vase. FINISHES: Matte or shiny metals, and mirrors, glass, various wood finishes, and glazed or unglazed pottery. Group your art or framed pieces together. They will not only look better but they won’t break-up the wall space by being scattered around the room. The more floor space you can see the bigger your room will look so “Leggy” furniture is perfect for this effect. Keep these 13 “downsizing designer tips” in mind and you’ll have the home everyone loves… including you! Find out ways we can also help you love your home without doing any major renovations by clicking “Curated Options” and “Collaboration“. Or call Mary for a free 15 minute consultation at 760-84-1200 or by connecting online. Turning the looks you love... into a home you love! © 2018 One Day Design. All Rights Reserved.